...where authentic Southern Style BBQ is our specialty. Since late 2007, we have taken special care in introducing the Pueblo Community to down-home style comfort eating. We pride ourselves on providing customers with Southern favorites including Beef Brisket, Pulled Pork, and Memphis Dry Rub Baby Back Ribs, among many other scrumptious favorites. All of our meats are slow smoked the old fashioned way with hard woods (ie. Hickory, Pecan, & Oak). Our meats are accompanied by a variety of Homemade BBQ Sauces. We pride ourselves in offering customers Traditional Homemade BBQ Sauce; a traditional sauce lover, try our Sweet Original, or if you are looking for a little kick, give our Spicy BBQ Sauce a whirl, and for those looking for something a little different, we offer a Southern Carolina Traditional BBQ Sauce, our own Carolina Mustard Sauce! Once you try our sauce, you’ll be hooked! Come in and experience for yourself this traditional, neighborhood atmosphere in our cozy dining room. Enjoy an evening out with family and friends at GG’s BBQ, with dishes sure to please every appetite, from big to small, and everything in between. Top off your meal with one of our Homemade Fresh Baked Desserts, including Chocolate Chip Cookies, our famous “Homewrecker,” a double chocolate brownie cookie loaded with peanut butter chips and topped with chocolate ganache, our old traditional Carrot Cake, a customer favorite, and several other sweet delights. 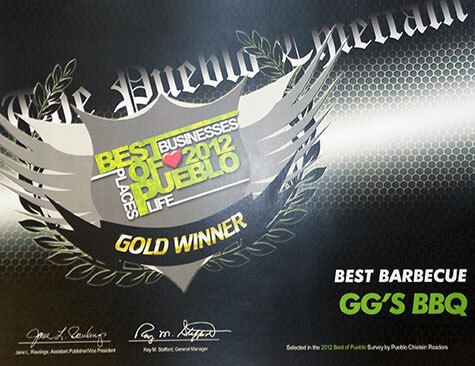 We look forward to seeing you soon and making you and your family a part of our GG’s BBQ Family! Open-faced Pulled Pork Sandwich smothered in Baked Beans with a side of Coleslaw. Open-faced Beef Brisket Sandwich smothered in Baked Beans with a side of Coleslaw. Open-faced Smoked Turkey Sandwich smothered in Baked Beans with a side of Coleslaw. Bed of Fritos topped with Pulled Pork and smothered in Baked Beans & Coleslaw. Sauced Beef Brisket in between two grilled cheese sandwiches with pickles and onions. Side included. GG's BBQ Ver. 2.0 is now open! specified to meet the demands of any event, based on the number of people being served. We have the Party Pak menu, designed for small groups of people in the range of 15 to 100. If you find yourself needing to feed a much larger group of people we have a Large Group Catering menu designed for groups of 101 to 2000 people. We work with each customer to ensure their wants and needs are met and that each person has an exceptional BBQ experience.